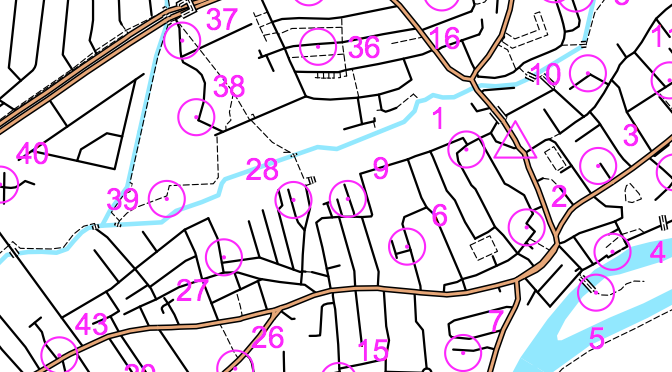 The third race of the 2018-19 season of evening street orienteering races around London will be held in lovely Teddington on Tuesday 13 November – our return to this area after 5 years away! This event is on Facebook. Say you are coming here! This event is on Attackpoint. Say you are coming here! Like all our Street-Os, this a public race – all are welcome. Please RSVP to the event via Facebook to let us know you are coming – you can also see who else is coming here and post queries. If you are not on Facebook, please let the organiser below know you are coming so that the correct number of maps are printed. This event will use electronic timing for the start and finish – please bring your SI card if you have one, or we’ll lend you one on the night! The Park Hotel is at 19 Park Road, Teddington, Middlesex TW11 0AB. It is 150m from Teddington railway station which is on the Waterloo-Richmond-Kingston-Wimbledon-Waterloo loop. Various bus routes (eg 33, R64, X26, 281, 285) also pass close to the pub. See www.tfl.gov.uk for further details. Trains to Teddington take 20 minutes from Wimbledon (every 15 mins) or 11 minutes from Richmond (every half-hour). Entry is £3 for SLOW and LOK members, students and juniors and £4 for others. This includes a hire chip card to record your time, or if you have your own you get a £1 discount. The Street-O format has clues located at various points on a map. You have 60 minutes to visit as many of these as possible, in any order, and return to the finish. This guide provides general information about street orienteering. Don’t forget to bring a pen to write down your answers to the clues as you go around, an SI card if you have one, and a watch so that you aren’t late back! You may find a torch/head-torch and compass useful too and hi-vis clothing would be sensible. All competitors take part at their own risk. You MUST be over 16 to take part in this event, unless you are accompanied by a parent or guardian. This is a condition of our insurance. Results will be available on the SLOW website shortly after the event. Check the 2018-19 series page for more information. We are South London Orienteers (SLOW), a Community Amateur Sports Club. We arrange and take part in orienteering and trail running. We have members of all levels of experience, mostly living in south, south-west and central London and northern Surrey. We welcome newcomers – do come along to one of our races. We are affiliated to British Orienteering. We organise the London City Race, the OK Nuts Trophy and other major races, as well more local events in parks and on streets around the capital and parts of Surrey. Orienteering in London and Surrey. British Orienteering's Club of the Year 2013. Community Amateur Sports Club accredited. Find out about forthcoming public events we put on, by Liking our Facebook page. We're also on Twitter. If you're already a club member be sure to join our active Facebook group for the latest on club socials, training, event photos and more.